Of course, the open league structure was abandoned in the first place because the league had become too geographically dispersed to make travel easy on traveling secretaries and players. While I normally won't defend the beauty sleep of millionaires, I'd kinda like to see my team fresh faced and ready to play ball every day. However, there's a reason you pay schedulers. There are certainly creative methods of organizing road trips and homestands to make this work for the greater good. A return to more geographically-centric roadies would be a good start. I'm not going to sit here and argue with anybody about interleague. It's been done to death over the past 15 seasons. Fact is, I don't care how many of you and your friends and your brothers' best friends' roommates don't like it. The league likes it, Bud likes it, it's here to stay. And anybody who's been to a Tuesday night A's game against the Royals has seen a live example of why interleague is a good thing. Without those three games against the Giants every year, poor Lew's team might already have gone the way of the Dodgers (snicker, snicker). If the alternative is a re-shuffled six-division structure, it could and should be done in a much more thoughtful manner than most have offered thus far. There are a lot of things I don't like about this Bleacher Report report*, but chief among them is the author's apparent ignorance of the century-old rivalry between the Giants and the Dodgers. (Yeah, he's got us in the AL, too. One of the o.g. Senior Circuit teams. C'mon, guy.) And no, I don't think that's a selfish point. 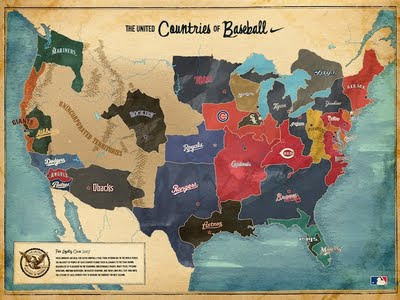 Under this alignment, the Yanks-Sawx and Cubs-Cards rivalries are preserved in the same divisions. Former GM Jim Bowden offered this missive on his ESPN blog, proposing a sea change realignment made up of two conferences. While on the whole, his idea has merit, the creation of the aesthetically pleasing "California" Division sticks the Mariners in a division with teams from three time zones, with the Rockies as their nearest divisional rival... 1,300 miles away. In truth, other than moving the Astros into the AL West as has been rumored, I don't see a clean fix to the six-division model. While I won't aggressively advocate for an expansion of the playoffs, I understand it's the will of the owners as well as the players, all of whom want a bigger slice of the national TV pie. And I'm comfortable with going to 10 teams — or a third of the league — while the NBA and NHL admit half their ranks, losing records and all, and the NFL takes 12. If it has to be done, they might as well make it a play-in game to increase viewership and minimize the impact on an already protracted postseason schedule. In a perfect world, I'd prefer keeping the playoffs at 8 teams and expanding the first round to seven games. Five playoff spots out of 15 teams in the open structure gives Team X a 33% chance of earning a playoff spot (quite a bit larger than 6%). When it comes to the six-division model, yes, two wild cards opens the possibility of three playoff teams from one division. But there's a caveat to that: Theoretically, the two wild card teams would have at least the 4th and 5th best records in their league. As we know from experience, it's not uncommon for a wild card team to post a better record than the second or third seed division winner. In either case, Team X would still qualify for the playoffs in the open model. Even more, they could end up with a higher seed and skip the play-in game altogether! @pgammo Two 15 team leagues with no divisions is long dead. Rustbelt and small market teams would be done. Yeah, Pete, because the Pirates, Indians, Reds, Royals, Twins, and A's are doing freakin' great under the current system! Small market teams are like the working class: they will always struggle, they will occasionally secure tiny victories, and they will go back to suffering soon afterwards. It wouldn't matter if the Pirates had spent the past 18 seasons in the NL Central or the National League at large. Either way, they'd have finished at or near the bottom of the barrel every single year. Finally, a number of bloggers have posited that the open league format reduces the number of cities with rooting interests in September because there's nothing exciting about playing for second place and the battle for fifth isn't all that intriguing. I don't know about you, but I couldn't care less about the Giants' seven divisional titles. All I care about is the ring we won last year. Point being, it doesn't matter how you get to October, so long as you win once you're in. As for sparking an interest in playing for the second seed... If your team is headed for a first-round showdown with, say, the Rockies, I'd imagine you'd prefer to have home field. And I don't see how the hunt for those play-in spots would be any less dramatic than the battles we currently see over the season's final weekend nearly every year. I'm never gonna be caught complaining when the powers that be think outside the box, whether that's in Washington, Sacramento, or the Owners' Meetings in Ft. Lauderdale. Change comes about via necessity or progressive action. It's only healthy to have owners and players who are consistently thinking about how to grow the MLB brand and keep the product fresh and vibrant for new generations of digital natives unburdened by a sense of geography. Maybe a radical shakeup is just what is needed to take advantage of public distaste with the NFL lockout and the potential of an NBA work stoppage and springboard baseball back into the pole position in the hearts of American sports fanatics. More playoff teams means more money, more interest, more money, more civic pride, and more money... Open leagues allows more rivalries to brew... And everybody's chances of postseason glory improve... Or maybe we should just boot the 'Stros to the AL West and be done with it. No matter what comes downstream with the next CBA, anything would be better than this. We rule the Left Coast!